The Honors Mentor Program is a unique leadership-development opportunity designed specifically for Honors College students. If you are interested in becoming an Honors Mentor, please review the information on this page and click the “Apply Here” button below. The deadline for applying is Friday, January 25th. A callout will be held on Thursday, January 17th in Honors Hall. The mission of the Honors Mentor Program is two-fold. First and foremost, the program provides peer mentorship to Honors students enrolled in the first-year curriculum, namely HONR 19901: Evolution of Ideas. Peer mentors serve these students by coaching them on how to work effectively in teams and how to successfully complete interdisciplinary projects. Peer mentors also provide more general support, welcoming these new students into the Honors community and helping them transition to college life. Second, the Honors Mentor Program provides its peer mentors with an enriched leadership development experience. The program’s unique curriculum couples the experience of project-team leadership with structured reflection, feedback, and self-directed learning activities. In this way, student leaders are given the tools they need to succeed in their roles, to maximize their learning, and to take ownership of their leadership development moving forward. The Honors Mentor Program follows a service orientation towards leadership, with emphasis on empowerment, ownership, and inclusion. At all levels of the program, each person’s primary goal is to facilitate the growth of others. Each interaction is regarded as an opportunity for promoting teamwork and leadership skills in all involved, such that everyone is empowered in the process. Careful attention is paid to the processes behind individual learning, teamwork, and community development, so as to help students more fully grasp these processes, to take ownership of them, and to pass on their learning to others. Whether within the Honors community at large, the mentor community, or individual project teams, the importance of inclusion is held paramount, with a recognition that inclusion requires both an open mind toward all people and a willingness to act on behalf of others. Mentors facilitate the healthy development of project teams and the successful completion of shared goals, i.e. course activities and projects. Mentors assist Honors faculty in promoting first-year learning outcomes of collaboration, critical thinking, and interdisciplinary awareness. Mentors take ownership of their development by learning leadership competencies, realizing their own unique strengths, and discovering strategies for developing further their leadership knowledge and skills. Mentors participate in building the Honors College community, which involves helping its newest members recognize the purpose and values of the college. Mentors support the growth of other mentors by being attentive and empathetic; they provide ample amounts of encouragement and positive reinforcement; and they share freely their struggles, successes, and insights with one another. Mentors will be able to facilitate healthy group development and create a strong, inclusive team culture. Mentors will be able to communicate and lead others toward a shared purpose and goals. Mentors will be able to develop teamwork and leadership skills in others. Mentors will be able to employ strategies for self-understanding and continued leadership learning. Mentors will gain knowledge of leadership competency language, which will allow them to better understand team and leadership development and more readily discuss it with others within and outside the program. Click here for a PDF of the Honors Mentor Program leadership competencies. Curricular Commitment: Mentors enroll in HONR 295: Honors Mentors, which provides instruction on recitation activities as well as leadership development. HONR 295 meets once a week for the first eight weeks of the Fall semester. 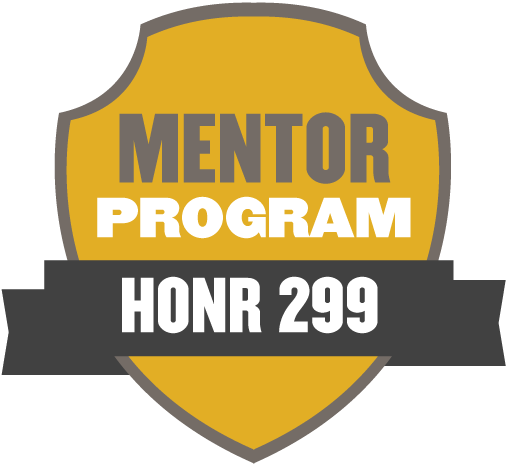 Mentors will also commit to attending a section of HONR 19901, which meets twice a week for the first eight weeks of the Fall semester. Mentors choose an HONR 295 /19901 pairing that works for their schedule. For this commitment, mentors receive 2 credits. Extracurricular Commitment: Mentors are required to participate in the annual orientation and training events that book end the first week of classes in the Fall semester. Returning mentors are expected to participate in the interview process for program applicants in February. Other extracurricular opportunities such as coffee hours, workshops, etc., are offered by the Mentor Council starting in March, which are designed to help program participants further develop their skills and build a healthy mentor community. Selection: Returning mentors are selected based on their commitment to both the curricular and extracurricular aspects of the program, as outlined above. For new candidates, applications for the 2019 Honors Mentor Program are due by the end of Friday, January 25th. A callout will be held the second week of classes in January to provide further information – be sure to check HNN for details. Applicants will be notified via email by Monday, February 4th as to whether they will be invited to participate in the second round of the selection process: a twenty-minute interview conducted by returning Honors Mentors on February 15th, 16th, or 17th. Invited applicants will have the chance to pick a time from several options. Applicants will receive an email about final selections by Friday, March 1st.